When people mention Vietnamese noodles, they may immediately think of “Pho”. In Vietnam’s cities, you’re easy to buy a noodle soup: in restaurants, traditional markets, supermarkets, and especially street stalls. We have noodle soups for breakfast almost every day, only change noodle dish to our preference. It’s common for breakfast and dinner, not so often for lunch. But remember, you have to eat our noodles with chopsticks along with spoon. For those who’re not familiar with using Asian chopsticks, it may be a good chance to learn. Travel to Vietnam, eat Vietnamese foods, do like locals, and have fun! In below part, I’ll show you in brief all main types of Vietnamese noodles. That’s not all, but only popular and typical ones. Pho (pronounced “fuh”) is a beloved and well-known food in my country. It is an “ambassador cuisine” that helps to introduce Vietnamese foods to the world. Together with Summer Rolls (Gỏi cuốn), Pho was proudly listed on "World's 50 most delicious foods" by CNN. The soup is made of rice flour noodles. It’s served with beef or chicken broth and meat, and accordingly called Beef Pho (Phở bò), or Chicken Pho (Phở gà). Pho also has distinct flavors thanks to herbs and species like: scallions, Asian basil, saw tooth herb, etc. Pho can be served in two ways: (1) with broth, called Phở nước; and (2) in dry, called Phở xào. It’s a must-eat if you ever want to taste Vietnamese noodles. So, why don’t try it yourself? This dish is made with rice vermicelli element. It’s somewhat similar to Pho, but tastes quite different. Bún can be served with broth and shrimp, duck, fish, crab. Maybe, it can be served dry with grilled pork (or tofu), garnishes, and dipping sauce. Bánh đa is another typical Vietnamese rice noodle, popular mainly in the Northern provinces and cities. In my city Haiphong, bánh đa is the favorite dish for breakfast. There’re two types we can choose: white rice noodle (bánh đa trắng), and red rice noodle (bánh đa đỏ). I have to say that the later is typical from Haiphong, and we have a nationwide famous Red Noodle with Crab (Bánh đa cua). 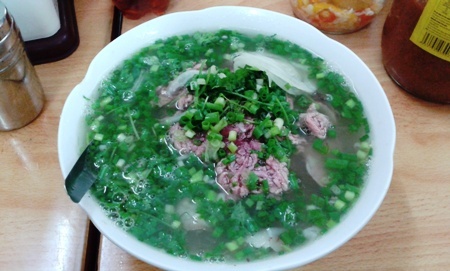 If you visit Haiphong, don’t forget to taste a bowl. You’ll love it. Miến or glass noodles are made of starch of a plant called Canna, and also sometimes referred to as cellophane noodles or crystal noodles. The foods have such names because once they are cooked, they become transparent and resemble glass, cellophane, or crystal. The soup is usually made with chicken broth, and served with noodles, chicken meat, and a plenty of elements including: wood ear, shiitake mushroom, scallions, saw tooth herb, bean sprouts, and onions. When the noodles go with chicken, we have miến gà. Chicken meat can be replaced by shrimp (to make miến tôm), or crab (miến cua). Hủ tiếu, or hủ tíu is quintessential cuisine of southern region. It was brought to Vietnam by way of Chinese immigrants hundreds of years ago. Frankly, I don’t know its name in English, even after spending much time on looking up. So, I just simply put it in Vietnamese name. This soup looks like Bánh đa but it taste sweeter thanks to sweetened broth and sweet bean sauce (tương ngọt), and has flavor of some typical herbs including: bean sprouts, Chinese chives (hẹ). It can be served with steamed beef (hủ tiếu bò kho), or minced pork and pig’s gut & liver (hủ tiếu Nam Vang). Similar to any other place in the world, Vietnamese also use instant noodle in these days. It’s a fast and convenient food, especially for days in bad weather: storm, flood, etc. 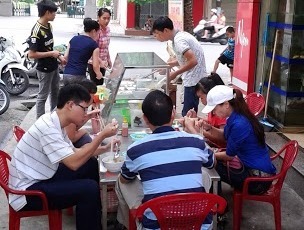 This isn’t absolutely a typical Vietnamese noodle, but many people also like it, especially young generation. My kids love instant noodle very much, more than any other types of Vietnamese noodle. I don’t know why. Perhaps, because they’re just kids, or because they’re adapting better to modern life, I’m not so sure. If you have a chance to taste some of Vietnamese noodles here in Vietnam or somewhere else, you will understand why traditional Vietnamese cooking is greatly admired for its creativity, fresh ingredients, minimal use of oil, and reliance on variety of herbs and vegetables. Many of them are also sold as street foods. And … I’m sure you’ll love Vietnamese foods. By now, how do you think about this article? Do you find useful information here? If you do, would you mind encouraging me with a Like button? If you don’t, please share your opinion and comment if possible; I’d love to hear from you!